SWTOR 5.2 Gunnery Commando PvE Guide by Damian. With 5.0 commandos finally get some long needed improvements in the defence department. This careful tuning was done with the aid of a sledgehammer. Anyone looking for hot tips on Gunnery Commando DPS can get a cutting edge guide with the patch number of 3.0 on it because Gunnery has not changed since then. Commandos and Troopers in general saw some thinning out of abilities on the toolbars. Gone forever are: Stockstrike, Pulse Cannon and all Cells. Cells are now built into the specialisation tree you choose. The default Cell when you have no spec is an invisible Plasma Cell. It is now impossible to detect a Commandos spec by looking for the Cell buffs on their bar. Also, Supercharged Cell is now 3 different abilities and the right one is granted to you with your specialisation tree. This apparently is to get rid of the gigantic combined triple description in the tooltip. No big deal but you now need to move that icon about when spec swapping because the ability does change between specs. Your default Supercharged Cell when you have no spec is the Assault version. Much nostalgia for lost abilities but the bottom line is Stockstrike was 4m and Pulse Cannon was 10m cone, neither in any rotation or buffed by any talents. Many rants about garbage Commando talents involved the only root requiring Stockstrike. Which leads on to significant changes to Combat Proficiencies. Commandos for years had very fixed choices because the majority of options could be used to fertilise your garden. The 5.0 overhaul means that all Commando talents do something in a meaningful way. Some are multiple old talents glued together. Saying that, the unchanged talents of Cell Capacitor (extra resources), Shock Absorbers (permanent AOE reduction) and Forced March (Boltstorm on the move) are still very fashionable. What matters is that available points increases from 7 to 8 and you get real choices to customise your Combat Proficiencies for a particular fight or PVP action. I mentioned a defensive sledgehammer being used earlier. There are two astonishing 5.0 talents you can choose which double the power of the (normally rubbish) Adrenaline Rush and grant up to a 75% heal after Reactive Shield ends if you survive the duration respectively. A new ability is also on the toolbar. Echoing Deterrence is 6s of immunity to direct single target damage and bounces half the damage back to the attacker. Developers have finally implemented survival changes for Commandos and have done so with real enthusiasm. No obvious damage boosters were granted to Commandos in 5.0 so have a second look at the non obvious ones. 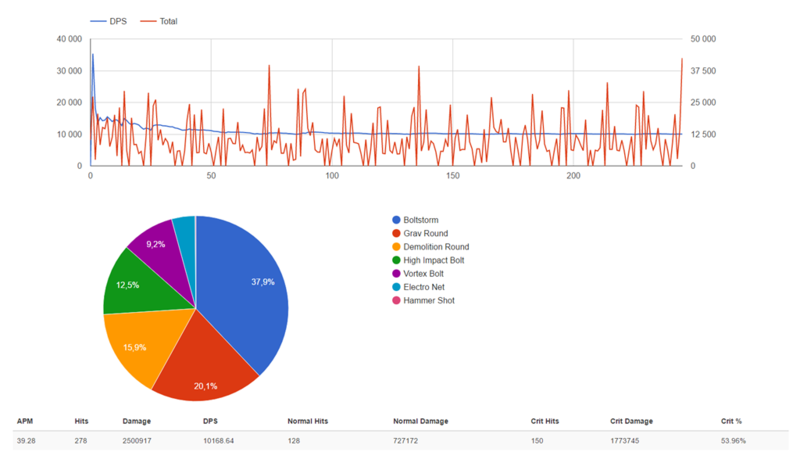 Echoing Deterrence bounces 50% of single target damage back to the attacker, examine your boss fights more closely, things you think are AOE attacks are not always scripted as AOE damage. Electro Shield has been around for ages, take predictable damage and the attacker gets hit by your shield. This normally pushes up healing requirements if you literally stand in fire to do it but you can now talent to get your own healing from Adrenal Surge and/or Trauma Stabilisers to cover that health cost. Reflexive Shield to reduce Reactive Shield CD was never a bad talent but you only had two points for the top tier in the old system. Forced March and Shock Absorbers were far more valuable. These choices no longer block each other and you have an extra talent point to get Electro Shield out more often. That’s the essentials of the 5.0 changes. For information on playing Gunnery Commando and more details on Utilities and Abilities read on. The Gunnery specialisation is excellent at single-target damage, target swapping and burst damage. AOE damage is good but not exceptional. The heavy armour, defensive abilities and light healing makes the class very tanky for a ranged DPS. Gunnery has always been a strong raiding spec, it provides three buffs and debuffs for the group, passively takes reduced damage and delivers strong ranged damage through an easy rotation with no energy management drama. PVP performance has often been highly suspect over the years but the 5.0 defensive improvements have made it very competitive. Accuracy is the most important stat for PvE DPS. If you have below 110% accuracy you have a chance to miss attacks of all types. The goal for this at level 70 is 737. To reach this I suggest you use 1x Advanced Initiative Enhancement (can be found in Gloves or Boots), 3x Advanced Accuracy Augment 45 (96 accuracy) with an Advanced Polybiotic Proficient Stim (240 accuracy). The next most important stats are your Critical and Alacrity ratings. Critical rating affects both how often you deal critical damage and how much extra damage a “crit” will cause. For Gunnery Commandos a high critical rating would be over 50%. It is especially important for Commandos because they are the only class with a passive 30% critical damage boost in their DPS trees and a critical hit with your biggest hitting attack of a Demo Round is the massive difference between hitting 10k or hitting over 30k. Your Alacrity rating decreases the Global Cooldown between ability uses, decreases ability cast times (Grav Round), ability channelling (Boltstorm) and all cooldowns. Your actions per minute or APM have potential to be higher when using higher Alacrity. So, the stats you can modify as a PvE Gunnery Commando are accuracy rating, critical rating and alacrity rating. Once you have reached >736 accuracy points you should improve your alacrity and critical stats. 6 critical enhancements – Adept Earpiece, 1x Adept Implant, Main-hand weapon Enhancement, Chest Enhancement, Gloves Enhancement, Pants Enhancement. 3 alacrity enhancements – 1x Quick Savant Implant, 1x Headpiece Enhancement, 1x Off-hand Enhancement. 1 accuracy enhancement – 1x Boots Enhancement. Augments: 2x Critical, 9x Alacrity, 3x Accuracy. The set bonus name is: Eliminator. Relics: Serendipitous Assault and Focused Retribution. Many descriptions have been simplified to avoid copy/pasting unnecessary information. There is a basic for PvE below if you are lazy or not experienced enough. Skillful: take the energy management and AoE buff to clear trash faster. Masterful: if you don’t need a longer HTL you can take the 5% damage reduction and Electro Shield to make your Reactive Shield an offensive cooldown. Heroic: you want AoE damage reduction, buffed Adrenaline Rush and Reflexive Shield to improve your defensive and offensive capabilities. Legendary: Boltstorm on the move to increase mobility. Why Adrenal Surge and not Trauma Stabilizers? Only direct damage will build stacks of Trauma Stabilizers, unless you are tanking a mob this won’t work. Remember: Good players will swap their utilities to suit the fight. Tenacious Defense – Reduces cooldown of pushback by 5s, Propulsion Round by 3 s and stun breaker for 30s. COMMENTARY: Useful for PvP and situational for PvE (for example, shorter stun break for Torque) but usually you would take something better. Concussive Force – Explosive Round (it was Stockstrike before 5.0) immobilizes target for 4s also makes your pushback effect stronger to it pushes 4 meters further away. COMMENTARY: 30m range root and longer punt range on knockback is generally useful in PVP and situational in PvE (for example, saber pushing vs Revan or rooting Chained Manifestations vs Styrak in S&V). Parallactic Combat Stims – You recharge 20 energy cells when stunned, immobilized, knocked down or otherwise incapacitated. COMMENTARY: Not high priority for PvP due to lack of energy issues but you can use it for PvE as a situational utility if there is nothing better (for example, little add on DM Bestia immobilizes you or grenades on Master&Blaster can knock you down). Cell Capacitor – Recharge Cells immediately recharges 15 additional cells and grants 10% alacrity bonus for 6s. COMMENTARY: Situational for PvP (if you like to spam Grav Round, AOE or dot spread on CD) and mandatory for PvE for the bonus energy. Chain Gunnery – Increase the damage dealt by Hail of Bolts by 25%. COMMENTARY: Nowhere near lethal damage even when buffed so not that useful for PvP (unless group damage is your tactic) but very useful for PvE in fights where you can put it on 3 or more targets (for example, DM Bestia). Sticky Mods – Charged Bolt/Grav Round reduce the movement of enemy target by 40% for 9s. COMMENTARY: Mandatory for PvP for the long duration slow on targets and useless for PvE because it won’t work against bosses. Advance the Line – Increase the duration of Hold the Line by 4s. COMMENTARY: Generally useful if you have nothing better for a bit of extra mobility in both PVP and PVE. Electro Shield – Your Electro Shield does X amount of damage to attackers up to once per second for the duration of Reactive Shield. COMMENTARY: Useful for both PvP and PvE as a basic utility. High priority for PvE because it makes your Reactive Shield an offensive cooldown instead of defensive. Suit FOE – Self cleanse reduces all periodic damage taken by 30% for 12s. COMMENTARY: Debatably useful for a DPS, this is typically a healers talent and damage on yourself is better dealt with by the healers. Charged Barrier – Charged Bolts/Grav Round and Medical Probe build a Charged Barrier that reduces damage taken by 1% next 15s, it stacks up to 5 times (i.e. 5% damage reduction with 5 stacks). COMMENTARY: It’s 5% damage reduction, easy enough to keep up if you have no better choices but not a priority for anything. Efficient Conversions – Removes the energy cost of pushback, CC, cleanse and stun abilities. COMMENTARY: From my point of view it’s useless for both PvP and PvE. Supercharged Reserves – Reduces the cooldown of cleanse and interrupt abilities. In addition, you can build up to 10 stacks of Supercharged while using Recharge and Reload (or any another out of combat health regen toy). COMMENTARY: NEVER use it with the aim of building stacks! It’s almost useless for PvP and very situational for PvE on a healer spec (for example, tank cleanse on Cartel Warlords). The main time I like to use it is for dummy parsing because it doesn’t proc relics as you build stacks unlike Med Shot. Reflexive Shield – When you take damage your cooldown of Reactive Shield is reduced by 3s (this effect cannot occur more than once in 1.5s). COMMENTARY: Finally! With 5.0 Commandos can use it as a main utility to get more uses of Reactive Shield in a fight. This also means more uses of Electro Shield and Trauma Stabilizers for added damage and healing. Good for both PVP and PVE. Overclock – Reduces the cooldown of CC and Tech Override by 15 seconds each. COMMENTARY: A very niche utility, not high priority for PVP or PVE. Reflexive Battery – Increase the damage dealt by your pushback ability for 30% and heals you and 7 allies in its range for X health. In addition, while you taking damage it reduces CD of pushback ability by 1s (cannot occur more than once in 1.5s). COMMENTARY: Useless for DPS spec. You might use it for an extra healing on a healer spec in both PvP and PvE but there are more useful utilities. Adrenal Surge – Adrenaline Rush heals you twice as fast up to 70% of your total health and increases the duration of Adrenaline Rush by 2 seconds. COMMENTARY: Extra useful for PvP and situational in PvE (for example, DM Brontes burn phase). You would usually take AOE reduction instead of this in most fights. Combat Shield – Reactive Shield now further decreases ability activation pushback by 30%, increases all healing received by 20% and makes you immune to interrupts. COMMENTARY: Can be useful in PvP with Reflexive Shield + Trauma Stabilizers combo but do you need it? For PvE you would prefer something more useful. Shock Absorbers – Reduces the damage taken from AOE effects by 30% and you take 30% less damage while stunned. COMMENTARY: Key survival utility for PvP and mandatory for most PvE fights (for example, Lightning Field on Dread Guards or the stab of Vilus Garr). In 4.0 you had to choose between Reflexive Shield or AOE reduction but now you can combo it to increase DPS and decrease DTPS. Forced March – Allows Full Auto, Boltstorm and Successive Treatment to be activated while moving. COMMENTARY: One of the most useful utilities for both PvP and PvE. It makes you more mobile. But if you need more defense and don’t need the mobility you can choose something else. One Man Army – Using Electro Net now grants 15% alacrity for 9 seconds. Additionally, Supercharged Cell reduces CD of Adrenaline Rush by 5 seconds. COMMENTARY: Works in PvP but not very good for PvE as you need a target without ‘Boss Immunity’ (trash). Smoke Screen – When you use Propulsion Round it protects you from being leapt to (charged) or pulled and makes you immune against interrupts and pushbacks for the next 4s. In addition, taking melee or Tech damage within 4s resets its cooldown. These effects cannot occur more than once in 40s. COMMENTARY: Situational in PvP and useless in PvE. Trauma Stabilizers – While your Reactive Shield is active, you generate a stack of Trauma Stabilizers (up to 15) each time you receive direct damage. When Reactive Shield expires, each stack heals you up for 5% of your maximum health. COMMENTARY: One of new 5.0 utilities. A powerful PvP talent and situational in PvE (for example, if you get lost on Dash’Roode and cannot use the personal shield). Supercharged Defense – Activating Supercharged Cell increases your defense chance by 15% and grants immunity to interrupts for 8s. In additional your Endurance and healing received are increased by 3% each. COMMENTARY: Useful for cheap interrupt protection in PvP (for example, activating combat node on Odessen Warzone) and quite bad for PVE, it’s a bundle of weak buffs at a high cost compared to what else you could take. Suppression Protocols – Stealth Scan Grants Suppression Protocols,increase the damage or healing dealt by your next non-channeled direct damage or healing ability by 20%. For each target, you revealed from stealth, you generate an additional charge of Suppression Protocols. This effect stacks up to 5 charges and lasts for 10 seconds. COMMENTARY: Revealing stealth targets for a buffed attack? Revealing up to 5 at once? Using a Legendary point for it? A talent for dreamers. [*]Reactive Shield – offensive cooldown with Electro Shield utility. Must be modified with Reflexive Shield utility for most uptime. [*]Echoing Deterrence – new Commando ability which has 50% reflect. Note it doesn’t work against AOE damage. You can do numbers like these if you know when to use the reflect. [*]Hammer Shot – basic filler. [*]Explosive Round – expensive AOE filler vs trash. Can be modified with Concussive Force for a root. [*]Electro Net – one of the highest damage abilities for a single GCD. Unique for PvP because it slows down and prevents all mobility abilities. For PvE it acts as a powerful DoT. Can provide an alacrity boost with One Man Army utility on targets without Boss Immunity buff. [*]Charged Bolts – basic cast attack. Gunnery replaces this with Grav Round after level 10. [*]Full Auto – basic channelled attack. Gunnery replaces this with Boltstorm at level 58. Both can be modified to channel on the move with the Forced March utility. [*]High Impact Bolt – high damage attack. [*]Supercharged Cell – damage booster and grants 10 energy. You can modify it to also be a DCD with the Supercharged Defense utility. [*]Sticky Grenade – has a detonation time, does kinetic damage up to 8 enemies when it detonates. [*]Plasma Grenade – does kinetic damage up to 8 targets in 8m radius also dealing additional periodic damage to affected targets within 6s. [*]Mortar Volley –Commandos highest AOE damage ability which does kinetic damage within 5 meters of the target area over the duration. [*]Hail of Bolts – AOE damage ability which does kinetic damage within 5 meters of the target area over the duration. You can buff it with the Chain Gunnery utility. [*]Cleanse – cleanses friendly target up to 2 tech or physical negative effects. Can be modified with Suit FOE utility. [*]Reactive Shield – increase damage reduction by 25% for the next 12s. Can be modified with Electro Shield, Reflexive Shield, Combat Shield and Trauma Stabilizers. [*]Hold the Line – grants 6s of immunity from all movement-impairing effects, knockdowns and physics and increase movement speed by 30%. The most useful ability for Revan. Can be modified with Advance the Line. [*]Adrenaline Rush – heals you up to 35% of maximum health for 8s. Can be pre-cast which makes it trigger automatically once you go below 35% of your health. Can be buffed with Adrenaline Surge. [*]Tenacity – your stun breaker. [*]Med Shot – basic healing ability, as DPS you use it to build stacks of Supercharge for Supercharged Cell before a fight. [*]Medical Probe – spammable cast healing ability. Charged Barrel boosts this together with High Impact Bolt but only a single ability can consume the buff. Can be modified with Charged Barrier utility. [*]Bacta Infusion – Instant heal for about the same as Medical Probe. Useful for PvP self-heals. Try to use Medical Probe instead if you have time since this goes on a cooldown. [*]Emergency Medical Probe – combat revive. [*]Supercharged Celerity – Alacrity raid buff. [*]Concussive Round – CC. Can be modified with Efficient Conversions and Overclock. [*]Disabling Shot – interrupt. Can be modified with Supercharged Reserves. [*]Propulsion Round – Commando’s backwards leap. Can be modified with Smoke Screen. [*]Concussive Charge – pushback utility. Can be buffed with Concussive Force utility. [*]Cryo Grenade – stun. Can be modified with Efficient Conversions. [*]Tech Override – makes next 1 (or 2 with Overclock utility) cast abilities activate instantly. Boltstorm– your main rotational ability on Gunnery. Proc Curtain of Fire as often as possible to make Boltstorm available more frequently. Grav Round – your main filler ability. It grants an armor debuff on a target for everyone in your raid group. Also, marked targets are vulnerable to high Impact Bolt and Demolition Round. Both the armor debuff and mark stays on the target for 45s but are refreshed by further Grav Rounds. Builds stacks of Supercharge. Costs 15 energy cells. Demolition Round – highest single GCD damage ability on Gunnery. Use it ONLY if target is marked by Gravity Vortex for 25% more damage. Costs 15 energy cells. High Impact Bolt – second highest single GCD damage ability on Gunnery if it is used with 5 stacks of Charged Barrel. Vortex Bolt – does a huge hit if it crits. Allows your next Grav Round to be activated instantly only if Vortex Bolt hits the target, if it misses then that effect never happens. Costs 12 energy cells. Supercharged Cell – recharges 10 energy cells and increase armor penetration by 10% for 8s. Abilities which build stacks: Hammer Shot, Grav Round, Med Shot and Medical Probe. Experienced players build stacks with Med Shot before combat. Armor-piercing Cell – before 5.0 you had to switch energy cells for each discipline but now they are all passive. Charged Barrel–Grav Round grants Charged Barrel, increasing the damage dealt by the next High Impact Bolt by 6% or reducing the activation time and increasing the healing dealt by the next Medical Probe by 20%. Stacks up to 5 times (should be used only at 5 stacks). Blazing Barrel – Increases the critical chance of Hail of Bolts by 15% and it’s critical damage bonus by 40%. Cover Fire – Full Auto and Boltstorm slow the targets movement speed by 70% for 3 seconds with each hit. (Not big in PVE but you are constantly slowing players in PvP by using Full Auto/Boltstorm). Gravity Surge – Grav Round now applies an additional stack of Charged Barrel and Charged Barrier, if applicable (Charged Barrier utility). You now reach the max 5 stacks in just 3 casts. Ironsights – Vortex Bolt marks its target. Marked targets take 5% more damage from ranged attacks. Decoy – Diversion grants 5 charges of Decoy. Each charge of Decoy intercepts and absorbs an incoming Force or tech attack. Each time you absorb a Force or tech attack in this manner, Decoy loses 1 charge. Lasts up to 10s (there is no damage limit so its a great DCD. For example, you can “eat” orbs on DM Brontes by using Diversion and going into it at any time but only once per 45s). Curtain of Fire – Grav Round and Hail of Bolts finish the cooldown on Boltstorm and increase the damage dealt by the next Boltstorm by 10% (i.e.you can use Boltstorm every 8s). Gunnery rotation has a priority system not a fixed rotation like Assault Specialist. But no worries, if you make a mistake you don’t need to spam Hammer Shot, you will just loose burst. Opener is the same as in the 3.0 Fascinate and Marisi guide (remember it hasn’t changed since then) but for the core rotation I use another priority system. Grav Round procs Curtain of Fire and resets the cooldown of Boltstorm every 8 seconds; 3x Grav Round gives 5 stacks of Charged Barrel for the High Impact Bolt buff and Vortex Bolt allows an instant cast Grav Round. I prefer to use High Impact Bolt + Demolition Round because it provides the highest burst in both PvP and PvE. Also, Demolition Round is off cooldown almost every time you have 5 stacks of Charged Barrel ready so you don’t need to worry about lining them up. You should proc “Curtain of Fire” (by using Grav Round or Hail of Bolts) on cooldown then move to Vortex Bolt -> High Impact Bolt + Demolition Round -> Boltstorm -> Grav Round -> Boltstorm. Let me explain what you see above. Only two of the Grav Rounds unlock and buff Boltstorm. Grav Round #1 procs Curtain of Fire at the end of its GCD. Grav Round #2 is instant because of Vortex Bolt so it procs Curtain of Fire at the beginning of its GCD. High Impact Bolt is already buffed because of 5 Charged Barrel stacks from Grav Rounds #2, #3 and #1. Grav Round #4 is a filler so you can use Electro Net or Hammer Shot instead or can be skipped at all. Also, you can use Electro Net between Grav Round #1 and Vortex Bolt since the “Curtain of Fire” buff lasts 15 seconds. In addition, you will automatically use the 6-piece Eliminator set bonus every time when it procs (which makes Demolition Round critically hit). Note that in real combat with target swapping you probably won’t be able to keep rotation above alive. Once you swap targets you need to apply the Armor Debuff from Grav Round and Ranged Attacks debuff from Vortex Bolt (if not on cooldown) then you can move to High Impact Bolt + Demolition Round and Boltstorm as available. Keep in mind, Gunnery is primarily a single target spec so you need to choose between single target or bursts of AOE damage. It is not the best for long periods of AOE. Your strongest AOE attacks are Mortar Volley and Hail of Bolts. The last one you can spam without cooldown. Use Supercharged Cell when spamming Hail of Bolts to increase armor penetration and help a bit with energy management. Below is a basic example of burst AOE (for example, it would perfectly work on DM Calphayus for seed defending and crystals fluff phases) but don’t forget to take Cell Capacitor and Chain Gunnery utilities. You can also do light AOE with a Tech Override + Plasma Grenade if you have 2 targets near each other (for example, Dread Guards or Jarg&Sorno). The key of a good Gunnery player is cooldown knowledge. Your main target is to proc Curtain of Fire and use High Impact Bolt + Demolition Round on cooldown and not to use Hammer Shot. If it’s not a dummy fight which is a simulator of “perfect circumstances” you won’t have any energy issues on Gunnery. Just play smart, high DPS comes with experience. A bit about Hammer Shot on Gunnery. You would prefer not to use this ability. I use it sparingly during sustained combat or to finish low health targets and avoid wasting energy. Also, during operation boss fights where you need to kill adds (for example, DM Styrak) where targets die quickly you can waste time and DPS with the cast of Grav Round on a target which might die before the Grav Round even gets there. In such situations you should get used to using Tech Override. Your resource management is not difficult but to get the most DPS you need to be using your energy heavily and rotating through your energy resources of Supercharged Cell, Reserve Powercell and Recharge Cells (with Cell Capacitor talent). Once happy with how to manage cooldowns and resources your aim should be to increase your APM (actions/abilities per minute) so you’re not wasting time between abilities deciding what to use next. The information below does not cover every scenario as I haven’t had a chance to personally test every operation fight yet. Thanks to the author of this document. IMPORTANT: Leave red circles before reflect runs out (Propulsion Round is good for this). DP – DM Tyrans: flame in the doorway. Rav – Torque: stand in fire to reflect Dangerous Fire Device. Note, you won’t kill it just with a single reflect. Personal thoughts about Echoing Deterrence: The blocking of damage is great. The reflection of damage is extremely cheesy but it can be used with great effect against certain mechanics to boost your damage output. If you want the most advantage you should get a proper MMO mouse. Modify UI (User Interface) to suit yourself and make important information more visible. am Damian from the Red Eclipse server however my original server was Tomb of Freedon Nadd, currently a member of /. You can catch me on TRE on Damiah (Commando), Damianh (Vanguard), Xaruvoy (Mercenary) and Damiany (Powertech). My enjin profile is here if you’d like to ask any question directly, check a few brainless game screenshots/videos or just add me as friend (moar friends!). I have enjoyed playing Bounty Hunters/Troopers since 2013. I’ve been raiding on Commando since 3.x expansion but became more serious during the 4.x expansion and have cleared all content. I am not the best Commando player but I hope this guide can help new and old players improve themselves. Feel free to ask questions or give suggestions but I may not be able to respond often. Special thanks to my guildmate Hotwired for solving grammar issues in this guide and improving overall quality. Finally I’d like to thank Fascinate and Marisi for inspiration. Also, I’d like to thank my guildmate Splashie for being better than me in most fights, he always shows me ways to improve. Special thanks to my guildmates and friends who keep me interested in this game also to Dulfy for publishing this guide (she is also a nice person :P). – Don’t be a pleb!